In 2013, to achieve drought reduction mandates, a Drought Planning Group was convened to identify short and long term conservation measures and operational changes. This group included representatives from Facility Management and Development, Environmental Health and Safety, University Housing, Associated Students Incorporated, the Cal Poly Corporation, and CAFES Ag Operations. This group was responsible for creating Cal Poly's Drought Response Plan. From the Drought Response Plan, three primary short term conservation measures and one longer term infrastructure measure were prioritized. The short term conservation measures include building plumbing systems, automated landscape irrigation management, and precision-irrigated agricultural operations. The long term infrastructure measure is the development of sources of recycled water in cooperation with the City of San Luis Obispo. A strategic approach was implemented to meet these goals involving all effected stakeholders in the planning process and within the three main operational areas a variety of suggested retrofits, upgrades, and improvements were implemented. While the Governor's 25% by 2016 reduction goal applied to personal water use only, Cal Poly's Drought Planning Group felt that in order to honor its commitment to resource stewardship and act on behalf of the water that the Governor's goal should apply to ALL Cal Poly water uses and expanded the scope to include landscaping, agriculture, and building water use. Areas where turf was removed in response to the drought are being redesigned using drought tolerant and native plantings to create beautiful water-wise landscapes. 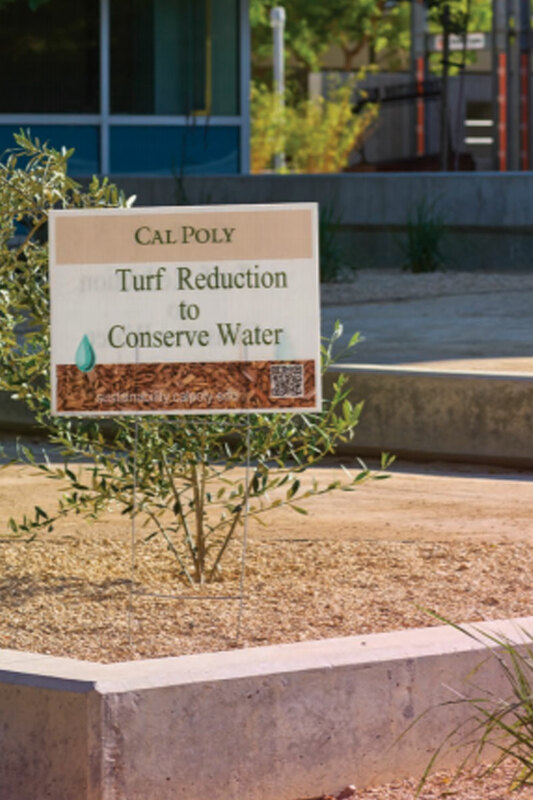 After the popular Cal Poly Rodeo was held in Spanos Stadium for Open House 2016, which put significant strain on the underlying sports turf, Cal Poly chose to experiment with a new water conservation technology to help the field recover. AquaCents—an inert, non-toxic water-holding polymer—was injected at the turf’s root zone, holding water where the grass can make optimal use of it and decreasing the need for irrigation. 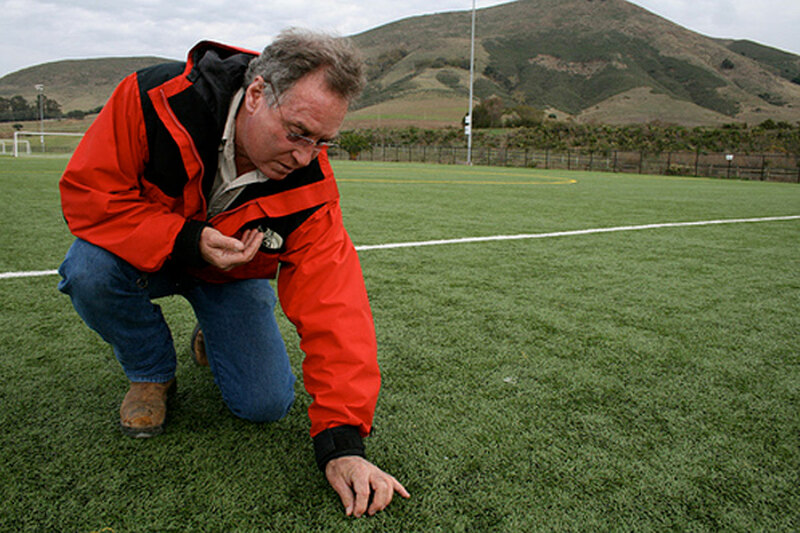 Case studies show a potential 45 percent water savings with no reduction in turf health or appearance, and the technology is being evaluated for application on other large turf areas. With a generous gift from numerous donors led by the Doerr Family, Cal Poly’s football and soccer practice facility was completely renovated—receiving a new scoreboard, goalposts, soccer goals, filming towers, and a 140-yard synthetic turf field—eliminating the need to irrigate nearly two acres of turf. To make the best use of limited regional water resources, Cal Poly is also collaborating with the City of San Luis Obispo to evaluate opportunities to procure or produce recycled water for use on landscape and agricultural land. Use of recycled water for these purposes will free up potable water supply to serve some of the new buildings and facilities envisioned by the new Master Plan. While water reduction efforts are ongoing across campus, the projects that have been implemented as of December 2015 have already resulted in a reduction to ALL water uses by 31%, surpassing the Governors 25% potable water use reduction mandate. This effort has saved 141,419,521 gallons and has generating over $500,000 in water and sewer utility costs savings compared to the 2013 baseline.